As Kilma Forum and Øksnehallen – the new place of civil society and NGOs gathering- were packed with people on Thursday night and because of super cold weather, I decided to head back with Khun Amarit. It was in the evening period in which most of the Head of State have arrived and the Gala Dinner hosted by the Queen at Christainsborg Slot was about to begin. Watching COP15 news report from one of the Danish TV channel at kitchen area of Gladsaxe Statdium’s dormitory, I was very excited to see breaking news of Greenpeace convoy with fake Head of State made it to the red carpet at the gala diner of the queen!!!! And banners with ‘politicians talk, leaders act’. It has been repeating so many times on that TV channel. It was rocked. Aside from red carpet Head of State action, there was live debate on that TV channel where the moderator was asking question to Debaters – Kavin Rudd Australian Prime Minister, Ms. Buyelwa Sonjica South African Environment Minister, Mohamed Nasheed President of Maldives, Felipe de Jesús Calderón Hinojosa President of Mexico and representative of EU – as well as invited audiences to take the floor. 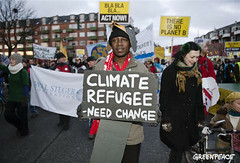 One of audiences was Kumi Naidoo – Greenpeace International Executive Director who addressed on global action for Fair Ambitious and Binding deal. Another audiences who took the floor was Lumumba Stanislaus Di-Aiping, Chief Negotiator of G77 who referred to Nobel Laureate Archbishop Desmond Tutu’s letter that was written to all leaders saying – better no deal than bad deal-. “the fundamental of this deal are extremely flawed” he ended. The moderator also put question “It is fair to say there will not be a full complete international binding treaty in Copenhagen, so what next” and asked Kavin Rudd to respond. “We need to do anything in a couple of day in order to reach an agreement, anyway what we want to do is to start a new negotiating process after Copenhagen in order to reach a binding treaty. We are going to ask anybody, American, Chinese to put on table to reach an agreement. This is the only world we do have and we do not have much time left” Concluded Calderón. “Legally binding is possible here in Copenhagen, it’s just need leadership to resolve that kind of outcome” Stressed Buyelwa. “Industrialised countries have brought climate talks to the brink of collapse by refusing to accept deeper greenhouse gas emissions cuts or provide adequate funding for developing country action and adaptation. Anger over this failure to take the lead has led to developing countries suspending work on several occasions and created divisions between the vulnerable countries who are fighting for their survival and the emerging economies who want to hold industrialized countries to account but are afraid they themselves will be unfairly forced to take legally binding targets. .